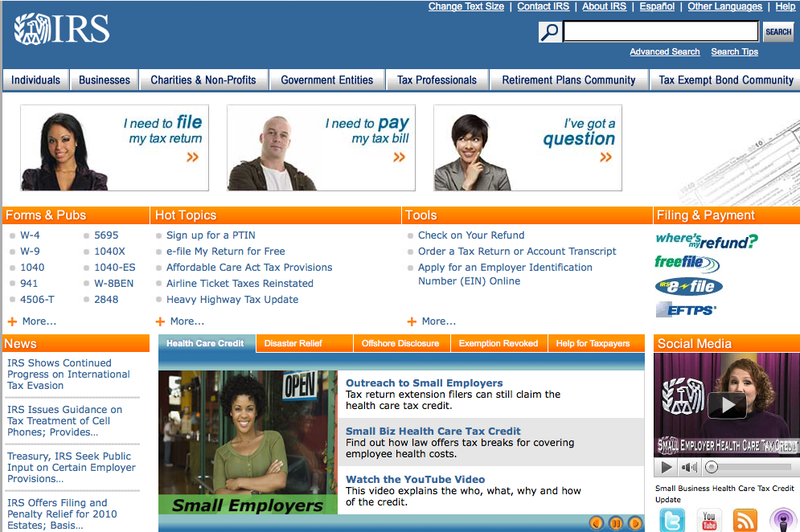 Site Name and Description: IRS, IRS website for individuals, businesses, non-profits, government, tax professionals, etc. Based in U.S. Site available in English and Spanish, Chinese, Russian, Korean, and Vietnamese. Design Overview: The site is very text heavy with a central photo slideshow. It’s a little overwhelming. The color scheme is orange with a gradation of light blues. There are photos and videos. The site’s hierarchy is difficult to follow. Business/Site Goals: Provide forms, tools, and news related to filing federal income tax in the U.S.
Social Media Integration: Connect with Twitter, Youtube, RSS, and podcasts.